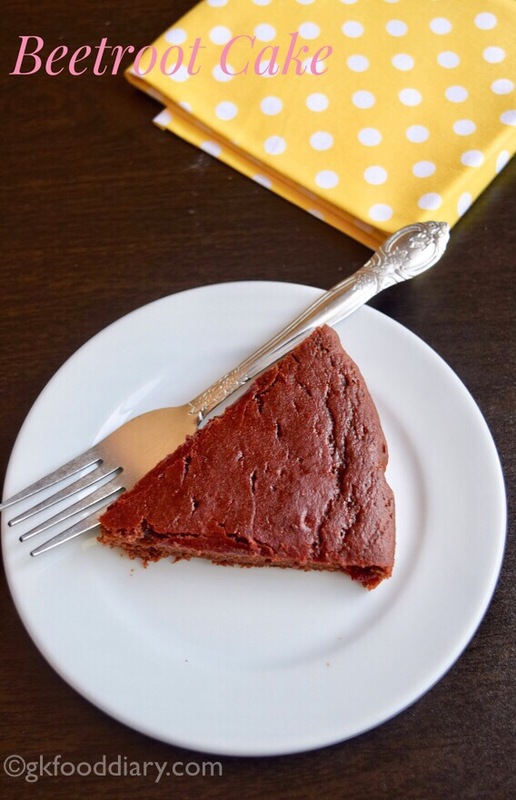 Eggless whole wheat beetroot cake – A tasty and healthy cake recipe made with whole wheat flour, pureed beetroot, cocoa powder and no eggs! Beetroot cake is a moist, delicious cake which melts in the mouth. 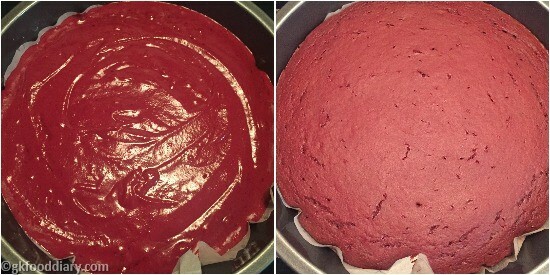 I have started experimenting recipes in baking, and this beetroot cake is my new try. These cake turned out warm and soft, and my daughter kept asking more! 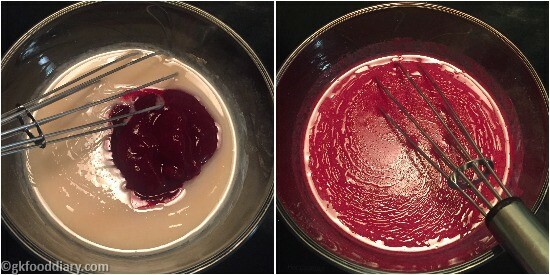 This beetroot cake can be given to toddlers after one year. Also, check out other healthy cake recipes for toddlers and kids. 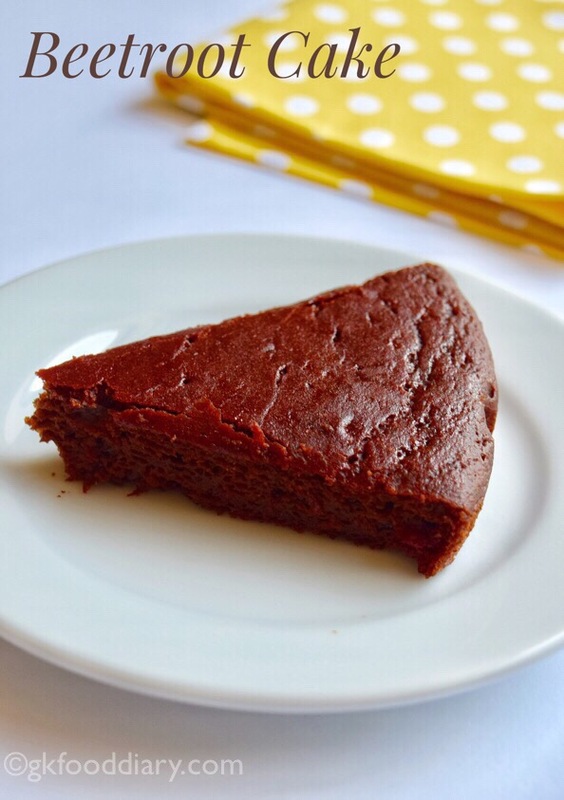 Now Let’s get on to check how to make this healthy eggless whole wheat beetroot cake. 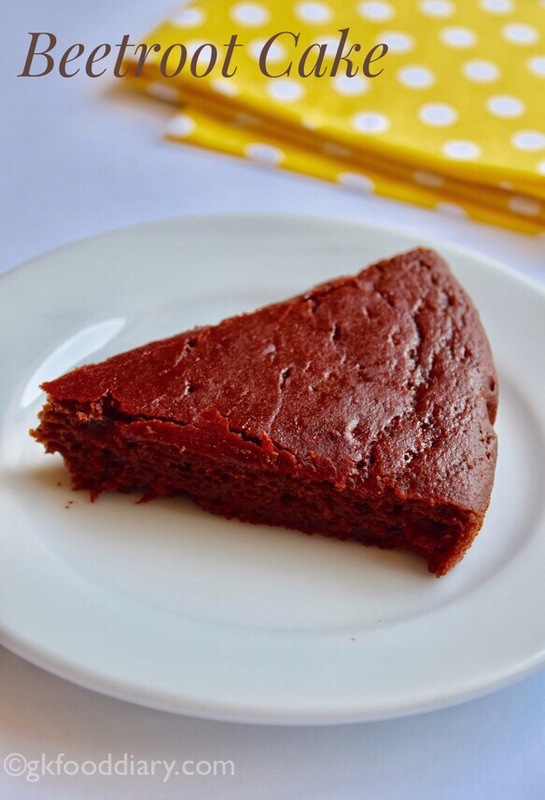 Whole wheat beetroot cake - healthy cake with whole wheat flour, beetroot puree and cocoa powder. Healthy snack for kids. Take one small beetroot, wash and chop them into cubes. Pressure cook it with little water for two whistles in medium flame. 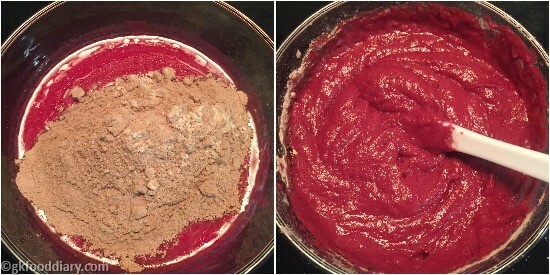 Add the cooked beetroot along with water to a blender. Grind it to a smooth paste. 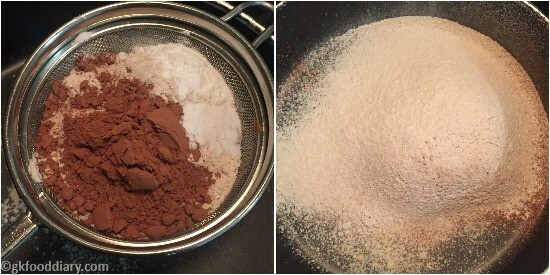 Sieve the whole wheat flour, cocoa flour, baking powder, salt and baking soda. Keep it ready. Also, preheat the oven to 180 deg C for 10 minutes. Take a mixing bowl, add thick curd/yogurt. Then add in brown sugar. Mix well until the sugar is melted. Now add in vanilla essence followed by oil. Stir it well with a hand whisk until the oil is mixed evenly. Then add in beetroot puree and give a quick mix. Once all the wet ingredients are mixed well, add the sieved whole wheat flour mixture to the wet ingredients. Gently fold everything well for 10-15 seconds. Don't over mix. The final batter should be slightly thick and at pouring consistency. Adjust with milk/water to get the desired consistency if required. Grease a cake pan with oil. Pour the mixture into the cake tin and gently tape it. Bake in the preheated oven at 180 deg C for 35 -40 minutes (baking time depends on the size of the cake pan and oven) at 180° Celsius till a toothpick inserted in the center comes out clean. Allow to cool it down completely and cut into pieces! 1. 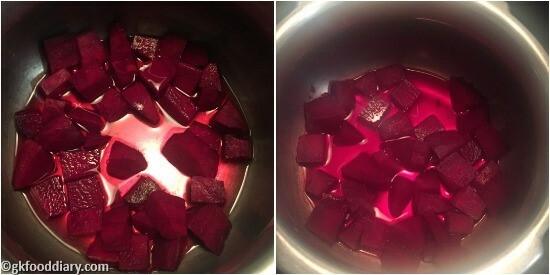 Take 1 small beetroot, wash and chop them into cubes. Pressure cook it with little water for 2 whistles in medium flame. 2. 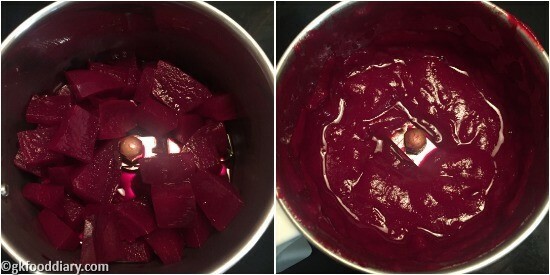 Add the cooked beetroot along with water to a blender. Grind it to a smooth paste. 3. Sieve the whole wheat flour, cocoa flour, baking powder, salt and baking soda. Keep it ready. Also, preheat the oven to 180 deg C for 10 minutes. 4. Take a mixing bowl, add thick curd/yogurt. Then add in brown sugar. 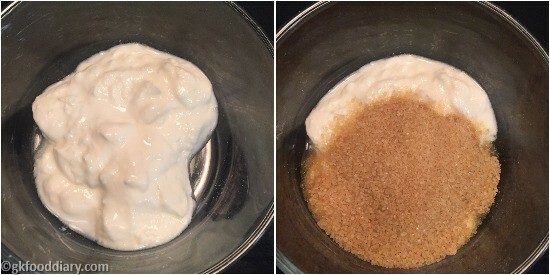 Mix well until the sugar is melted. 5. Now add in vanilla essence followed by oil. Stir it well with a hand whisk until the oil is mixed evenly. 6. Then add in beetroot puree and give a quick mix. 7. Once all the wet ingredients are mixed well, add the sieved whole wheat flour mixture to the wet ingredients. Gently fold everything well for 10-15 seconds. Don’t over mix. The final mixture should be slightly thick and at pouring consistency. Adjust with milk/water to get the desired consistency if required. 8. 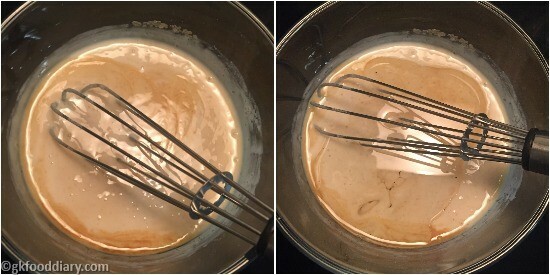 Grease a cake pan with oil. Pour the mixture into the cake tin and gently tape it. Bake in the preheated oven at 180 deg C for 35 -40 minutes (baking time depends on the size of the cake pan and oven) at 180° Celsius till a toothpick inserted in the center comes out clean. Allow to cool it down completely and cut into pieces! The delicious whole wheat beetroot cake is ready to serve!! Add few tbsp of extra sugar if you feel the mixture is not sweet enough. If the final mixture is too thick after adding wheat flour mix, add few tbsp of milk to get the desired consistency. Don’t over mix after adding the dry ingredients, just fold them for 10-15 seconds. This beetroot cake stays well for 4 days at room temperature and keeps good for a week if stored in a refrigerator. You could use any nuts of your choice to make it more healthy. Mixing and measurements are most important for the perfect cake. nice recipe….may i know your 1 cup measurement? is it 250ml or 240ml? 1. If the baking powder/baking soda is not enough. Try increasing the amount by 1/4 tsp extra next time.